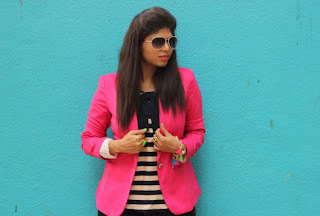 Stilettos Diary: Neon,Stripes and Bees. Spring has finally arrived! 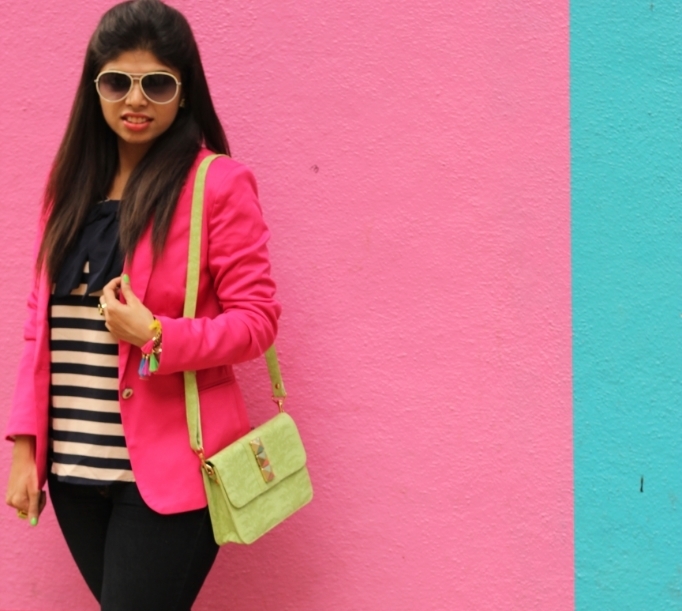 It is the time to wear loads of colors and take a break from the monotonous black and white outfits. Don't get me wrong. I love black and white trend but I quite need my daily dose of colors. Check out my new picks from Kiosha.com. Sunglasses - c/o - Fastrack India. Bee Ring - Commercial Street. and stripe flats are still on my wish list (never ending). Will probably pick it up for my birthday. I need to give a huge shout out to Persunmall.com. These heels are super comfortable. The color is perfect for summer. A bright pair of heels just glamorizes any outfit. Persunmall has a great referral program going on. REFER A FRIEND & EARN 15% CREDITS! Register on persunmall.com and start inviting friends and earn credits. 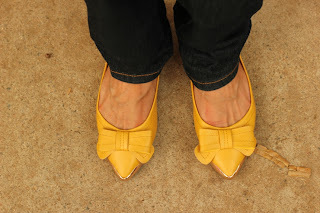 If you are not a heels person like me, then check out the mustard bow detail flats I found at Oasap.com. Super cute and comfortable. I kept the styling simple. Paired Navy blue denims with stripe top and candy colored blazer. I added more color with my nail polish, matching heels and colorful accessories. I have a hourglass figure so skirts and dresses look much better on me. Usually jeans highlights my unfortunate fact that I am bottom heavy. Of late I am wearing a lot of jeans to motivate myself to get back into the shape I was a few months ago. So, this week I will be starting my weight loss challenge and weekly updates on blog. Anyone interested to lose weight along with me please drop me an email. Let's motivate each other! P.S. While shooting for the blog post it started drizzling, added to the humid conditions, my hair started to frizz. By the end of the shooting my hair was 10 times the normal volume! Do let me know what products you use to control frizz? Photos thanks to Monish Shanmugam Photography. You have a great eye for accessories...love all of them. Esp, the bee ear rings, so cute! Hey! it is true to its size... My feet is size EURO 38/US 7/UK 5. I find it very comfortable. Great colors. I love your green shoes and mustard bow flats. I'm following you on google plus followers, hope you can follow back. I love this colourful outfit!!! And you're pretty girl!!! 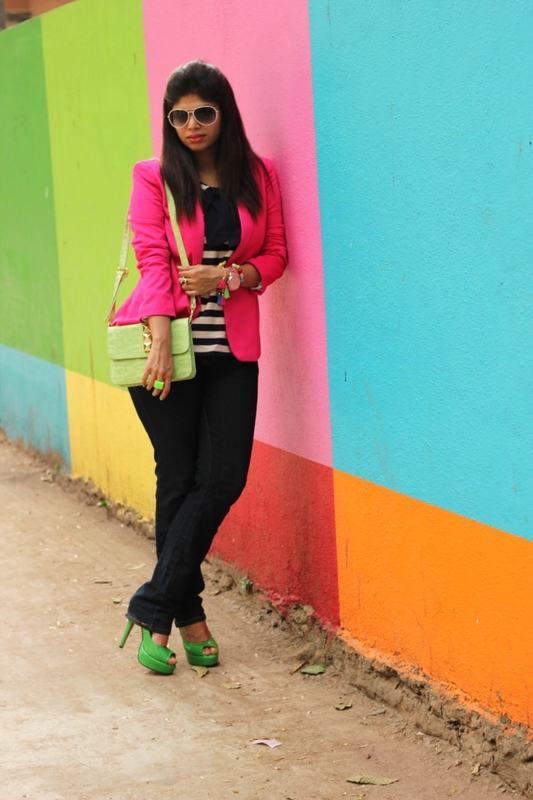 I love this colourful look! Awesome colors for the bright summer :) !!! Loved the stripes and yellow and green pumps!! So many bright colors- I love it! Where did you find that backdrop girl !! Its amazing. And I love your look, but I love the details you have put in, so much more. Can't take my eyes off that tassel bracelet. Its lovely ! Hi swati, I actually stumbled upon it when I was taking a shortcut!